With more than 80% of Americans attending a cookout or get together, the fourth of July is perhaps the biggest event of the Summer. This year, the 4th of July lands on a Monday, making it a long weekend of friends, food and fireworks. According to statistics, Americans will consume 150 million hotdogs on this July 4th. Furthermore, in the week leading up to July 4th, Americans purchased over 700 million pounds of chicken, 190 million pounds of red meat and nearly $500 million worth of fireworks in preparation for Independence Day festivities. With all the fun Independence Day brings, the combination of hot summer weather, fireworks, drinking and eating makes it a potentially dangerous holiday for our elderly loved ones. 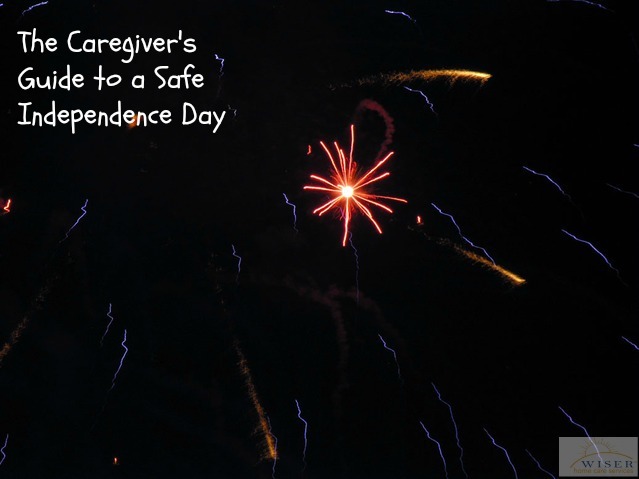 This week on our blog we are covering tips to ensure your elderly loved one has a fun, safe and healthy July 4th. Weather appropriate clothes and sunscreen on. Since many parties go into the night, layer clothing in case it gets cool. A safe, shaded place away from the heat of the grill. If your elderly loved one is wheelchair-bound, make sure the party location is wheel-chair friendly. Finally, make sure the bathrooms are close and easily accessible. Fourth of July parties bring out the best in Summer cooking: burgers, brats, salads, desserts. While eating these foods in moderation is ok, it is important to also provide healthier alternatives for elderly loved ones. Considering the hot weather, dehydration is a very serious risk for elderly loved ones. It is recommended that they avoid alcohol and always have a glass of water close by. Games Galore- Cribbage, Risk, Sequence, Scrabble, Charades. The list of fun picnic games goes on and on. Have your elderly loved one teach you a game from their childhood. Create paper flags or other patriotic crafts. If it is simply too hot, pop in a good patriotic movie and enjoy the comfort of air conditioning. Finally, enjoy the fireworks together. As always, if you care for an elderly loved one and would like help on the fourth of July or developing an extensive care plan, we can help. We will be happy to answer any questions you may have.